We’ve just launched 37 new content analytics dashboards onto the Performance Platform. We hope they will help people in government departments and agencies see at a glance how their content is performing. This blogpost tells you why we’ve built them, and our plans for the future. In addition an engagement module shows a count of feedback received to an organisation’s pages and the most commented pages. 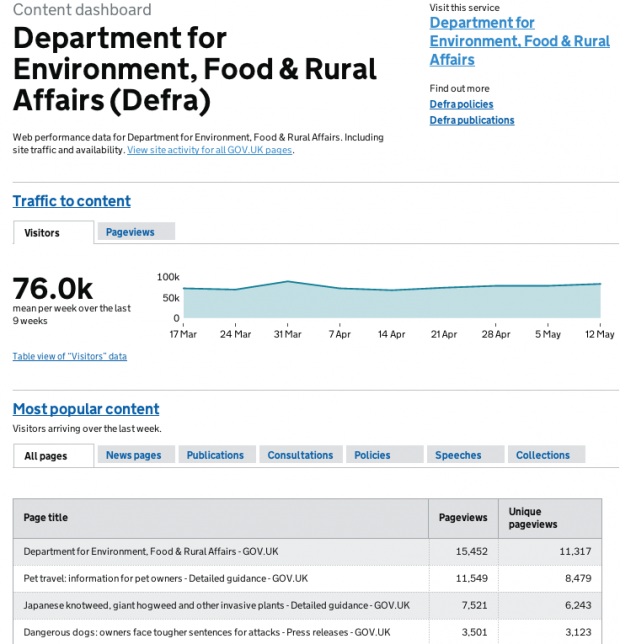 There is a wide community of people interested in the performance of 'their' content on GOV.UK. Many departments have someone whose role involves digital analytics and the GDS performance analysts have worked with them to provide an organisational view. However, in 2014 we realised we needed a step change in how we got performance information about GOV.UK content to the people that need it. Firstly, the transition of GOV.UK means that many more organisations need access to data. Secondly, within each organisation there is a range of people who need an overview of how ‘their’ organisation is doing. The first group of people who articulated a need were the Evaluation Champions - a group of communicators tasked with creating performance hubs for departmental communications activity. Earlier in the year we held a workshop with the Champions to establish their user needs for data about GOV.UK. As a quick win, we made dashboards within Google Analytics and emailed the Champions a monthly snapshot. We wanted to improve on this and were lucky to be able to work with our Performance Platform colleagues and an external data science company, ScraperWiki, to build dashboards that are more interactive and published to the web, so that everyone can access them. What was achievable within available resources. For example, we were unable to commission any new display modules so some modules display a rolling 9-week period. We want to normalise the feedback data so they show, for example, comments per 1,000 pageviews. Currently the modules cannot combine data from two sources, in this case ZenDesk and Google Analytics. There may be opportunities to bring in other non-digital datasets; such as call centre information. We’ll also extend the coverage of dashboards to additional organisations. The links to each dashboard are towards the foot of the https://www.gov.uk/performance page. There are a number of reasons why we've published this data on the Performance Platform. a) We're adding additional data from user feedback that is not available from web analytics. b) We know there's a demand from a wider community of people in government who want to know about their content on GOV.UK but don't have the time or inclination to engage with an analytics package. Please contact your Transition Manager to discuss direct access to GOV.UK data.